Welcome to Kundalini Yoga for All! Kundalini Yoga, as taught by Yogi Bhajan, is the yoga of awareness. Each yoga class includes breathwork, a physical yoga set, a deep relaxation and a meditation. The goal is to deliver yourself unto your true Self; the Universal Self. In class, you will use the breath, your physical body, and mantra to prepare the mind for meditation. In challenging the mind these ways, we can tame the wild swing of the mind and find our inner peace. 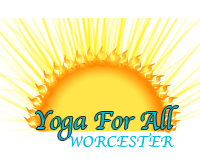 The yoga classes and events that are graciously hosted by the First Unitarian Church in Worcester, occur in the upstairs larger room called Unity Hall or smaller next door carpeted room called the Chapel. Enter via the upper level State Street lot. Parking is free. This yoga can be modified for any body, you do not need to be flexible to gain the benefits.